If you own loose diamonds or a piece of jewelry or are about to make a jewelry purchase, you may need a jewelry appraisal from an experienced jeweler. Here are some reasons you need an appraisal for your valuable, fine jewelry. The value placed on a piece of jewelry from a jewelry appraisal would depend on the reason you get an appraisal. For example, you may get a different value if the appraisal is for selling the stone instead of purchasing it from a retailer. Only an experienced jewelry appraiser can place a true value on your precious items. Without an appraisal, you might not be able to purchase insurance on most fine jewelry. Only proper, up-to-date prices will insure you for replacing your lost jewelry with like items. A jewelry appraisal for settling an estate will have different values that an insurance value. However the value is just as important. An appraiser can identify the jewelry’s condition, quality, workmanship, material and other characteristics that can affect its value. For example, diamonds appear similar to most people, however, each stone is different. The cut, clarity, color, durability, measurements, and fluorescence vary depending on the stone. 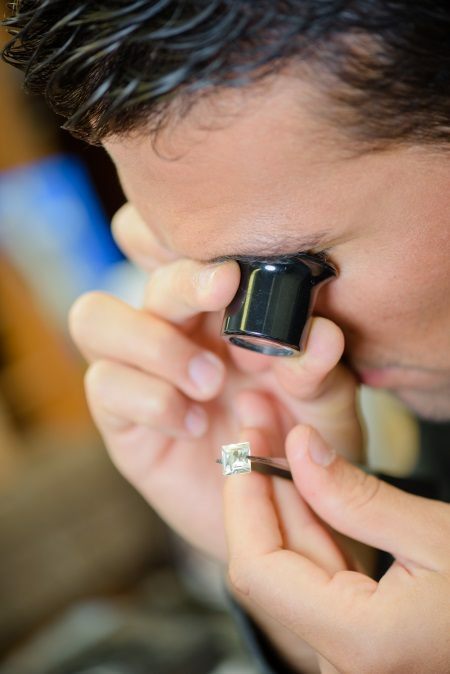 The difference in these factors can cause the value of one stone to double, even if the diamond appears the same to the unaided or untrained eye. The insured value of the item after a purchase is different than the value if you’re trying to settle an estate. You may also have a different value if the appraisal is used for expert witness testimony in a lawsuit or when distributing property in a divorce. If you are going to file an insurance claim for an item’s loss, then you be required to prove proof that the jewelry existed and the condition of the piece. An appraiser may insist on examining a piece of jewelry for a jewelry appraisal when they update an insurance appraisal. Your insurance agent will want proof of the lost or stolen jewelry’s existence. As a jewelry appraiser and a custom jeweler and diamond merchant I can help you with the process of replacing your keepsakes. The jewelry appraiser may offer you advice on how to properly care for your jewelry and maintain the piece. The various types of metal and gemstones used in jewelry can vary in their toughness, hardness, and resistance to chemicals or heat. A professionally trained jeweler with experience and knowledge can provide you with an unbiased recommendation on the durability and wearability of a piece of jewelry. We can use our experience to guide you even if it’s not something you purchased from us.